It’s the first month of the new year, and so much news about exciting new books has come across our desk of late that we thought we’d put together a couple of roundup posts in order to put some of the titles that we’re most looking forward to reading in the coming year on your radar. In today’s post (part 1), I’ll be discussing six recently published titles (five full-length books and one chapbook) that have made top priority on my to-read list for 2014. Part 2 (which will follow next week) will focus on forthcoming books that are due out in 2014. Desmond Kon is a two-time contributor to LR (his work appears in both issue 1 and issue 5), and both times that we’ve published him, Mia and I had a really hard time choosing just two of the poems he’d sent in each batch. Desmond’s work interests itself in philosophy, visual art, pop culture, and the sounds and textures of language: he is interested in dadaism and in other forms of the avant-garde, and has a unique gift for finding the music in both “high” language (such as academic jargon) and “low” forms of speech—slang, text speak, gossip column patter. The genius of his poems lies in their polyglot nature—the way that he mixes contrasting modes of speech and weaves easily in and out of a variety of languages. His pieces work because there is a delightfully haphazard quality to their approach, a lightness that plays against both the weight of the poems’ scale and subject matter and the deliberate care with which the poet has gathered, built up, and sculpted their many intricate layers of texture and pattern. Desmond, a highly prolific writer, has published multiple chapbooks (both in the US and in his home city-state of Singapore) and has a long list of journal and anthology credits to his name—and for good reason. I’ve no doubt The Arbitrary Sign—a philosophical twist on the form of the classic alphabet book—will be as delightful as the rest of his body of work. For a sneak peek at The Arbitrary Sign, head on over to Kitaab to read six of the poems that appear in the collection. This is a book I’ve been looking forward to for a long while now. Monica wrote for us as a staff reviewer from 2010 through 2011, and we later had the privilege of getting to publish a poem of hers in issue 4. Her work is deeply invested in myth and parable, and the textures of her writing are rich and sinuously complex—by turns liquid and transparent, and by others, knotty and grotesque. She has an exceptionally keen ear for music and magic, both of which suffuse her work. I had the pleasure of getting to read and workshop portions of Kala Pani back in 2009. It is a hybrid piece (partway between poetry and prose) that takes up the narrative of a group of world travellers who converge around an ancient tree. In it, the poet deftly plies together the fibers of what at first appears to be an allegory-like story, only to tease and unspun these threads mid-strand and remake them again (differently) in the next breath. What I admired most about the manuscript when I saw it in workshop was the way in which the tapestry of the piece’s language shatters and shifts at a moment’s notice—like quicksilver. Monica is a brilliant critical thinker, in addition to being a talented poet, and it shows in the deeply intelligent nature of her writing: though she is keen to investigate notions of trauma, geography, time, race, gender, spirituality, etc., her writing neither preaches endlessly nor holds to an overly simplistic view of the political: rather, she holds questions up to a mirror, testing them on a knife’s edge. She recognizes that the notions of place and identity are inherently fraught with instability, and she both celebrates and problematizes this complexity: the characters of which she writes transform and bleed into one another, metamorphose and cycle back to avatars of themselves, over and over again, in many different ways. It’s been a couple of years since 1913 first announced that it had acquired Kala Pani, and now that the book is finally out, I can’t wait to read the finished product. 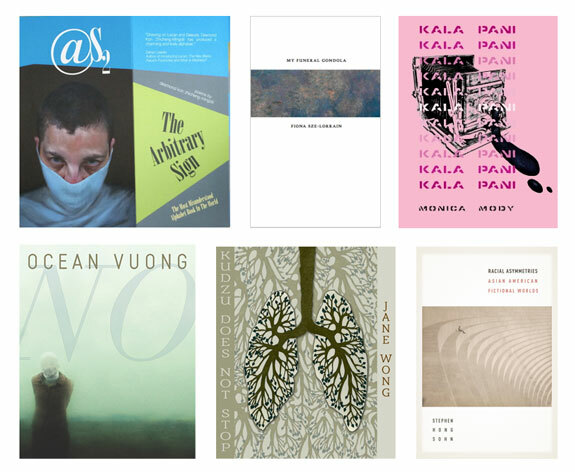 Excerpts of Kala Pani can be found at The Volta, the Boston Review, and Lies/Isle. Let’s dive straight in, examining three of the issue’s first poems and their wrestle with words and meanings. Phill Provance’s interlace poem “St. Petersburg Has Many Churches,” is perhaps the most abstruse, though its diction remains commonplace. The poem’s charm lies not in its form but in its unself-conscious vernacular. Its colloquial voice, inconsistent in a way typical to modern speech, uses contractions here but not there, and lumbers along monosyllabic platforms (many its, thats, and ises). The loftiest word is “ellipticizing,” but this neologism, rather than conjugating the Latinate directly (“ellipsing”), invokes the urban by conjugating gym ellipticals as root. All this results in the naturalization of the poem’s anfractuous form, such that it flows with incidental ease. This is hard to achieve. Provance himself comments that the poem is designed to be accessible despite its layered meanings, which makes it an appropriate gateway poem to the journal. Yet: why is a poem about St. Petersburg, or his second poem remembering lost love, placed as the opening of an “Asian Literary Journal”? The third stanza of “St. Petersburg” describes a vaguely Zen mode of seeing, but the other poem has nothing culturally comparable. We’ll return to this. Fiona Sze-Lorrain’s “A Talk With Mao Tze-tung,” though also colloquial, achieves a much steadier voice. This poem addresses the quondam Chairman’s mortal absence, because “you are nowhere / until a Swedish journalist recites your poetry / and wonders . . .” Living, and dead, and revived, Mao’s core vitality resides in his words and ideas, which become corporeal by revolutions. Thoughts march, words poison, books are buried. And along the way, vituperation must question itself: “why am I talking to you, dead man?” It seems language persists even when we don’t desire it, and since “history has no last word,” this poem ends in questions, and the talk with Mao must pause until an answer comes alive again. Kim-An Lieberman’s two poems are among my favorites for their adroitness. “After Ten Years,” a loose-octameter poem, turns list into narrative. The “Because” reiteration chants and expiates, swelling to crescendo; the final line hits the kind of poetic denouement that evokes quiet “hm”s from audiences at readings. In “Harvest,” we begin in miniatures (“single beads, stray buttons, broken twigs”) and end in nature’s enormity. The sound of children’s jubilance masks the tone and the suffocating fish onshore, until the ending when the ominous “sudden true hand” comes forth unveiled. Lieberman distinguishes herself in poetic brevity with truncated phrases like “This is not to sing / a strange-eyed child, some oracular pure . . .” and doesn’t sacrifice clarity for linguistic decoration, or vice versa. 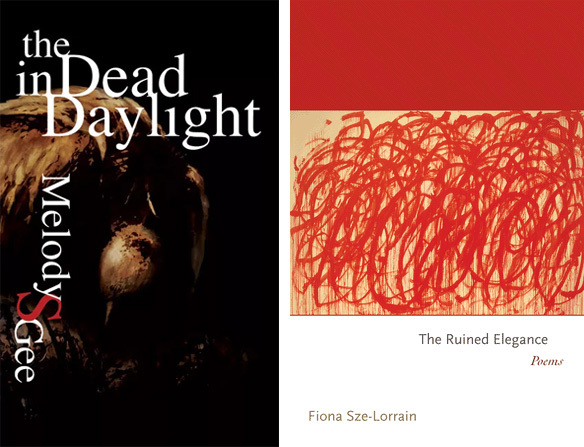 As we continue our exploration of ekphrastic poetry, poet Fiona Sze-Lorrain, whose first book (Water the Moon) we reviewed last month, graciously answers some questions that we’ve posed to her about the ekphrastic elements of her collection. LR: How do you envision your work with ekphrasis with respect to the larger arc or project of Water the Moon? FSL: Ekphrasis is indeed one of the many channels I turn to for building the muscle of my imagination. The Greeks say, “In the beginning was the verb.” How about “In the beginning was the image”? I remember having read — a long time ago — an interview with the French theatre artist, Ariane Mnouchkine, who (probably influenced by the Japanese theatre philosopher and pioneer, Zeami) perceived emotion as coming from recognition, which is an useful perspective for actors. In a way or another, I too define my experience of ekphrasis as emotion coming from recognition… for instance, by recognizing something in paintings that can transform descriptive clues to deceptively personal/emotional landscapes or narrative possibilities. Part of the larger arc of Water the Moon is about dialogues with artistic voices or consciousness that follow me like shadows over time. 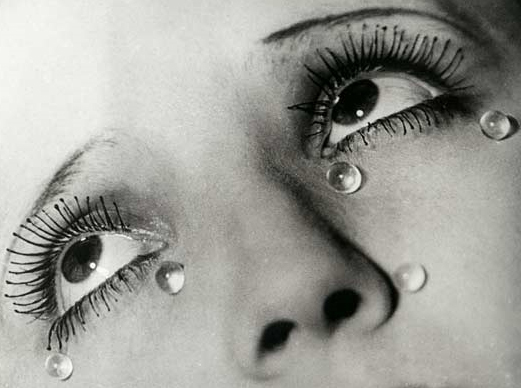 Steichen, Van Gogh, Dora Maar, Man Ray… these happen to be just some of them whose iconic images play a role in molding my sensibilities since a child. LR: In “Steichen’s Photographs,” you write “Photos have no verbs . . . / . . .Verbs are those trying not to pose” (58). Indeed, it seems that your ekphrastic engagement with photography in the collection is more immediate in nature than your engagement with other artistic media, like painting — for example, in “Van Gogh is Smiling,” you continually invite a reconstruction of his iconic images, “Let’s imagine fifteen sunflowers” or “Let’s retrace your starry blue night” (51), rather than delivering a direct experiential response to a particular work. In what ways does the camera’s eye provide a different type of visual or interpretive experience than other forms of visual art (e.g. painting, sculpture)? How did these differences influence your decisions about craft and perspective? FSL: Perhaps this is just a personal preference. I am married to a man who knows much about the world and craft of photography. 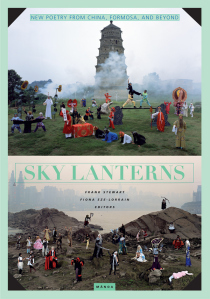 By chance and good fortune, I have also crossed paths with the work of a few important photographers of our times. So I tend to feel more intimate with photographs, though paintings, to be honest, always offer me the contemplative space whenever I need it. Photographs — less so. They tend to be more visceral for me, and contain specific social realities that I can more easily identify with or pinpoint. As you can see, the cover image of my new book of poetry, Water the Moon (italics) is also a photograph. (It is entitled “Cortona,” taken by American photographer, Blake Dieter, in Italy). The clock in it is a metaphor of the Moon – in terms of time. I like films tremendously too and sometimes imagine photographs as immortalised snapshots from an unknown film. In general, it is harder for me to be oblique when writing about photographs than about paintings. You do not see something just because it is visible. There must be something else. What is it? I don’t know. LR: Both “Steichen’s Photographs” and “Larmes” balance deftly on the seam between the perceived and the perceiver — in other words, we are made aware of the strange subjectivities at work when our gaze as readers is directed towards the speaker, whose observations become the subject of the poem as a piece of art, even while she herself is engaged in a process of fixing another artist’s subject in her own gaze. How can ekphrasis be of use to both the poet and the reader of poetry as an exercise in gaze, perspective, and subjectivity? To read more about Fiona Sze-Lorrain, please visit her web site. Water the Moon was released by Marick Press in February 2010 and is available for purchase on their site. Separation and distance resonate in the intimate moments she conveys. Her poems often begin with the specific and concrete, quietly expanding into a deeper reflections on what those moments represent. In “Breakfast, Rue Sainte-Anne”, she begins by describing congee (porridge) with, “Transfixed, I watch how the chef / shreds dried pork / into fine linear strips, drops / half-quarter slices of century egg / into a bowl of steamed rice.” The simple images soon turn into the speaker’s own relationship with the meal (“Today, I still have no idea / how to eat porridge with chopsticks”), and then into an imagined conversation with her father, in which he complains that both the taste and price of the food are nothing compared to “the rickshaw streets of his old Shanghai.” In this way, she goes beyond the initial preparation of congee to access memories and evoke longing. Sze-Lorrain’s speaker is not afraid to share her vulnerability, expressing her fears and uncertainties with dark images and sharp, precise language. The poem “Moon” opens with “symbolizes fear in my culture, / a dark force that hunts / until you cower.” These lines launch directly off the title of the poem, immediately plunging the reader into the piece. The poem “Invisible Eye” opens with “Fog / chalks the skeletons / of houses. I pry / open / doors of dusk.” The short lines propel the reader forward, paralleling the speaker’s hurried walk home while being followed.